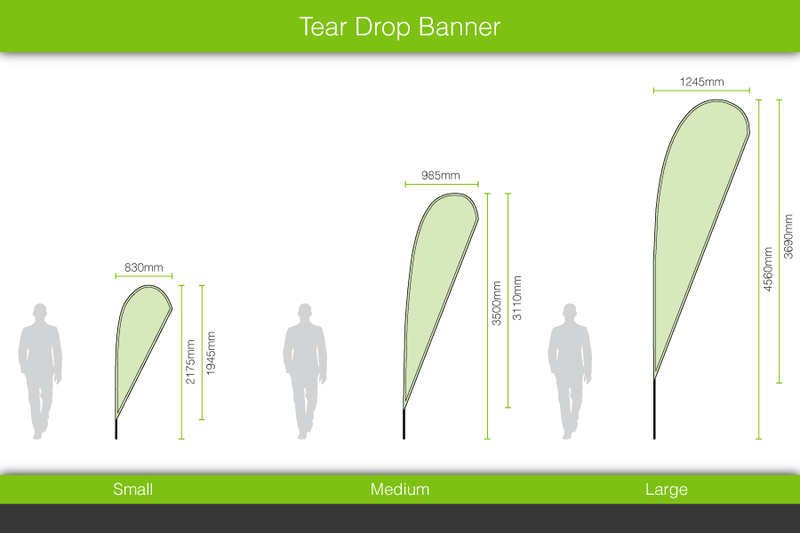 5 tips to find the best Teardrop Banners! How do you choose the best Teardrop Banners for your business, school or sports club? With so many different web sites and brands and varying quality of products, the decision has never been more difficult. Tip 1: Don’t get caught with flimsy, lightweight bases! Like all products there are good bases and bad bases. As the base will be used for a long time and is vital in it’s role of supporting the teardrop banner, it is important that you buy a good quality, heavy duty base. The most common base is a ground spike which is stuck into dirt or sand. There is a lot of pressure on the spike when the wind is blowing the banner and this can cause a thin, flimsy ground spike to bend at right angles. 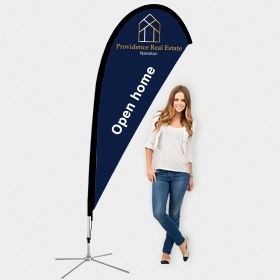 Make sure that the steel ground spike is a minimum of 13mm diameter and has a heavy duty ball bearing, swivel spindle that allows the banner to rotate with the wind. The ball bearings should be contained in a solid, fully enclosed barrel with a diameter of 35mm. Unenclosed and smaller diameter barrels tend to fail after a short time. Tip 2: Are your poles reinforced to avoid breakage? 1. The base of the pole is placed over the spindle of the base and it is this bottom 150mm of the pole that will bear all the pressure from the flag blowing in the wind. It is important that your poles are double reinforced in this area with steel sleeves - one sleeve on the inside of the fibreglass pole and one thicker sleeve on the outside of the pole. The total wall thickness of the pole at the base should be a minimum of 5mm and have 3 layers of materials - steel inner sleeve, epoxy fibreglass pole, steel outer sleeve. 2. When the teardrop banner is set up the pole is bent into a tight arc at the top to create the “tear drop” shape - which creates a lot of pressure on the pole tip. Standard poles tend to break in this area and then the jagged edge of the broken pole tears through the sleeve of the banner - rendering the whole product useless. Make sure you use quality epoxy fibreglass poles which are designed to withstand this pressure. To avoid breakages make sure you choose a supplier with epoxy fibreglass poles that have double steel reinforcement at the base of the poles. Tip 3: Make sure your price includes the base! Be careful when comparing prices to ensure that the base is included in the price being advertised. Some companies try to lure you in with a “cheap” price - but you then find that the “cheap” price does not include the base (which is a significant part of the total price). Once you add the price of the base to their “cheap” price, their total price is higher than the package price offered by a more reputable supplier. Making a good buying decision is not easy - particularly when there are dodgy overseas operators trying to look as though they are based in Australia. How do you make sure you are dealing with a reputable Australian based business? Firstly, check the information on their web site and make sure they have a stated an Australian address for their business. You can search the address on Google Street View to make sure it is actually a genuine business and not just a residential address. Secondly, see if their web site shows customer testimonials which are displayed by an independent 3rd party such as TrustPilot (not just selected “testimonials” inserted, and maybe written, by themselves). These TrustPilot testimonials (as shown below) are actual customer reviews and cannot be manipulated by the company themselves - so they will give you a great idea of how the company has performed for other customers. Tip 5: Is your “Medium” size really a medium size? One of the tricks being employed by some companies to try to fool the customer, is to “upsize” the size of their teardrop banners. They will advertise a medium size teardrop banner for an attractive price - but the size of this banner is actually the same as a small size being sold by other companies (at a lower price). Always check the actual size of the teardrop banner to make sure you are comparing apples with apples. 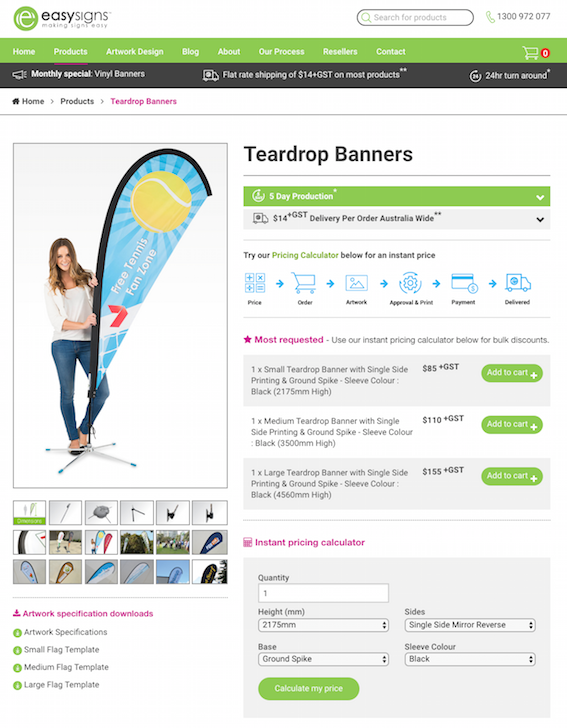 Hopefully these 5 tips will help you to make a good buying decision - so you find the best Tear Drop Banners in Australia! ​These Teardrop Banners come with strong reinforced fibreglass poles, heavy duty bases with fully enclosed ball bearing spindles - and an amazingly low price!